Safe Place to Play, 2014, Mixed media collage on paper, 50 x 72 inches. A Lovely Home, 2014, Mixed media collage on paper, 50 x 72 inches. Cultural Center Joined by Public Art Community, 2014, Mixed media collage on paper, 50 x 50 inches. Open House, 2014, Mixed media collage on paper, 50 x 50 inches. Stepping Out, 2014, Mixed media collage on paper, 72 x 50 inches. Walkthrough, 2014, Mixed media collage on paper, 50 x 50 inches. Upward Mobility, 2014, Mixed media collage on paper, 72 x 50 inches. 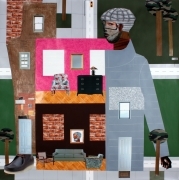 Derrick Adams, Walkthrough, 2014, Mixed media collage on paper, 50 x 50 inches. Derrick Adams destabilizes cultural understanding of urban and identity politics through performance, collage, sculpture, and installation. 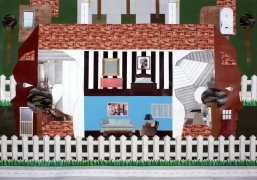 For Borough, his first solo exhibition with Rhona Hoffman Gallery, Adams presents a sculpture and seven new mixed media collages that visually rupture lines between human figures and domestic architectural spaces. Bodies, structures, and landscapes emerge from cut scraps and images from popular lifestyle magazines that the artist stockpiles in his Brooklyn studio, the material in turn reflecting today’s fragmented, over-inundated visual culture. Borough continues upon Derrick Adams’ ongoing Deconstruction Worker series, motivated by architectural vocabulary and presentation strategies. 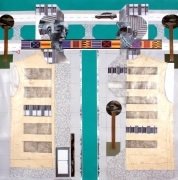 Adams began his exploration of the urban dweller using a floor plan, elevation, and presentation as his framework. He now explores the idea of “footprint” - the figure and structure’s existence within their community. Ink, pencil, paint, crayon, printed shelf-liner and other faux surfaces create geometric constructions of human figures in an ambiguous state between construction and deconstruction. Both subject and object, the figures derive from iconography in American culture, educational television programming, and institutional critique in contemporary art and shed light on persuasive, performative, and often duplicitous identities. 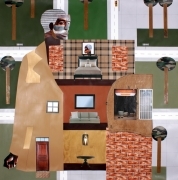 The shift between figure, architectural space, and abstract pattern evokes an artistic heritage in Romare Bearden’s urban collages and Jacob Lawrence’s vivid depictions of the African-American experience. Derrick Adams’ visually rich surfaces depict his contemporary socio-cultural moment, and upon investigation reveal themes prevalent in his oeuvre. 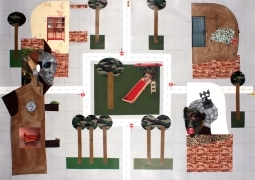 Reflective papers flatten the image; clothing pattern templates include a hoody, suggestive both of current events and artist David Hammons, whose work is a source of inspiration; human eyes gaze at the viewer from faces constructed of angular African masks; and in a self-referential move, Adams inserts earlier Deconstruction Worker collages into the newly-constructed domestic architectural spaces. 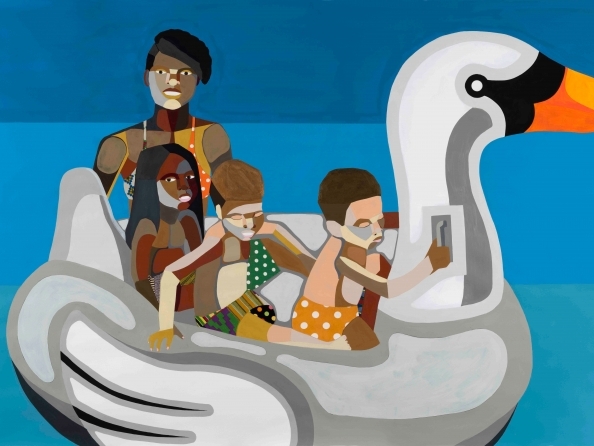 An interdisciplinary artist based in Brooklyn, New York, Derrick Adams received a MFA from Columbia University in New York and BFA in Art & Design from Pratt Institute in Brooklyn. He is the recipient of a 2009 Louis Comfort Tiffany Award and an honored finalist for the 2011 William H. Johnson Prize. Solo, group, and performance exhibitions include Veni Vidi Video, Studio Museum in Harlem, 2003; Greater New York, PS1 MoMA, Queens, 2005; Dissecting Intersections: Performative Responses, Bowery Poetry Club, New York, 2010; Go Stand Next to the Mountain, The Kitchen, New York, 2010; and Artist Experiment: The Institution of Me, Performa Hub, New York, 2013.